Summer Theatre 2017 is going strong. Click on the banners below to order tickets online for any show. Or call the SunTrust box office at 704-330-6534 fro 10:00am to show time. CPCC Summer Theatre Single Tickets on Sale May 1st! CPCC Sumer Theatre brings a musical theatre tradition to the Halton stage for the first time with Fiddler on the Roof. Tevye the Dairyman, tries to protect his daughters and his way of life from a changing world.Top of FormBottom of Form Winner of nine Tony Awards when it debuted in 1964, Fiddler on the Roof is the brainchild of Broadway legends. Touching audiences worldwide with its humor, warmth and honesty, this universal show is a staple of the musical theatre canon. Rich in historical and ethnic detail, Fiddler on the Roof‘s universal theme of tradition cuts across barriers of race, class, nationality and religion, leaving audiences crying tears of laughter, joy and sadness. With iconic and beloved songs such as “Sunrise, Sunset,” “If I Were a Rich Man” and “Matchmaker, Matchmaker,” Fiddler on the Roof is the perfect mix of audience-pleasing humor and heart. CPCC Summer Theatre is happy to bring A Chorus Line to the Halton stage for the first time as the musical celebrates its 40th anniversary year. A Chorus Line is a celebration of those unsung heroes of the American Musical Theatre: the chorus dancers– those valiant, over dedicated, underpaid, highly trained performers who back up the stars and often make them look even more talented than they are. It is also about competition. For everyone, at one time or another, puts his life on the line. We all compete, no matter what business we’re in, for promotion, for attention, for approval and for love. A Chorus Line departs from the usual glossy backstage musical by presenting a true picture of what it’s like to be in the theatre: glamorous, yes, at times, but also tough, heartbreaking and sometimes even tragic. Roald Dahl’s James and the Giant Peach is a fantastical tale of an orphaned boy, his insect friends and their amazing journey across the ocean on a giant peach.Top of FormBottom of Form Featuring a wickedly tuneful score, Roald Dahl’s James and the Giant Peach is a delightfully offbeat adaptation of the classic Roald Dahl adventure. Filled with conniving aunts, magic potions, human sized insects, and a tremendous peach, we go along with James as u;ses his quick wit and creative thinking to create a new family for himself in the face of hunger, seagulls, sharks and the Empire State Building. Join us as CPCC Summer theatre brings this exciting adaptation to life on the Halton Stage for the first time. 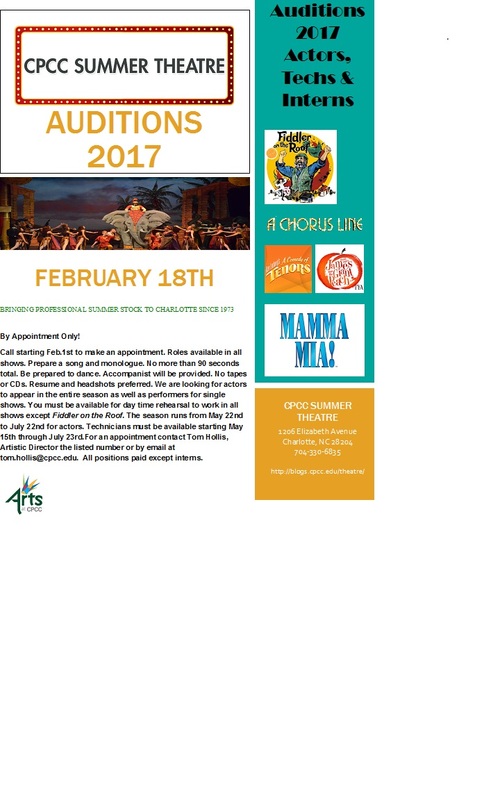 Fresh from the Broadway stage, CPCC Summer Theatre presents the local premier of ABBA’s Tony Award winning musical Mamma Mia! on the Halton stage. Using the hit songs of ABBA, Mamma Mia! tells the hilarious story of a teen’s search for her birth father on a Greek island paradise. On stage and in the movies over 54 million people all around the world have fallen in in love with the characters, the story and the music that make Mamma Mia! the ultimate feel-good show! A mother. A daughter. Three possible dads. And a trip down the aisle you’ll never forget! The story-telling magic of ABBA’s timeless songs propels this enchanting tale of love, laughter and friendship, creating an unforgettable show. Non-stop laughs and explosive dance numbers combine to make Mamma Mia! a dancing in the aisles hit for CPCC Summer Theatre 2017. CPCC Summer Theatre will hold auditions for performers 13 and under on February 20 & 21 at 7:00pm in the lobby of the Halton Theater. Roles are available in Fiddler on the Roof and James and the Giant Peach TYV. Roles are available in both shows. Prepare a song. Preferably no more than 16 to 32 bars. Be prepared to dance. An accompanist will be provided. No tapes or CD accompaniment allowed. Bring sheet music in the correct key. Fiddler on the Roof will start rehearsal on April 17th in the evenings Sunday – Thursday until opening. James and the Giant Peach TYV rehearses daytimes 9:30a to 4:30p Monday – Saturday starting June 12th until opening. We are looking for actors to appear in either or both shows. You must be available for day time rehearsal to work in James and the Giant Peach TYV. Fiddler on the Roof rehearses on Sunday afternoons and Monday – Thursday evenings. For more information contact Tom Hollis at the number below or by email at tom.hollis@cpcc.edu. CPCC Summer Theatre is a non-Equity summer stock company presenting a season of musicals and non-musicals to the Metrolina area. 2017 will mark the 44th anniversary of the company. Visit our website at http://blogs.cpcc.edu/theatre/ for more info about the program. We value your feedback. How is our service at CPCC?